Compare Domestic Airports in New Zealand at Canstar Blue. Christchurch Airport, Auckland Airport, Dunedin Airport, Hawke’s Bay Airport, Nelson Airport, Tauranga Airport, Wellington Airport and Queenstown Airport were compared on waiting areas, parking, communication, facilities, ease of check-in and overall satisfaction. New Zealand offers an array of natural beauty. From tropical beaches, Canadian-styled forests and lakes, perfect skiing slopes to volcanic landscapes. They say mother nature conjured up the best parts of the world and placed them in the land of the long white cloud, Aotearoa. For such a small nation, there’s no surprises domestic airports are so plentiful. As a matter of fact, there are 28 domestic airports in New Zealand with the major domestic ones being Auckland Airport, Christchurch Airport, Dunedin Airport, Queenstown Airport and Wellington Airport. With New Zealand being split into two islands, domestic flying is a given. In the top 13 busiest New Zealand airports alone, there were a recorded 41, 028, 916 passengers. Imagine around 10 times the entire population of Kiwis, travelling New Zealand, and this shows just how important it is to get domestic airports right! For those of us that have travelled, we all know it’s even the small detailing that make a huge difference when getting to our destination. And, our wallets are pleading with us not to bust out unnecessary purchases to relieve the discomfort travel can often bring. So, when airports gift us with comfort, and cheap at that, you bet your dollar we are lapping it up. We’re here to let you in on a little secret on the airport details Kiwis loved. 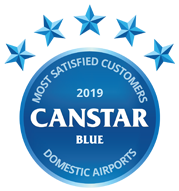 Canstar Blue asked Kiwis who’ve used a New Zealand domestic airport in the last year, to reveal their thoughts on the waiting areas, parking, communication, facilities, overall satisfaction and ease of the check-in for domestic airports. Christchurch Airport really took off this year, winning top domestic airport in New Zealand and 5 stars for overall satisfaction. It was also recognised as 5 stars for waiting areas, communication, facilities and ease of check-in while only losing out on parking which was given 3 stars. Dunedin Airport was second choice for Kiwis, which was given 5 stars for ease of check-in and 4 stars for every other factor. And two more airports received 5 stars, Tauranga Airport for parking and Queenstown Airport for ease of check-in. Domestic flights in New Zealand are expensive but travelling New Zealand is definitely worth it, and this is coming from someone who’s lived here for 20 years – it never gets old. 47% of Canstar Blue’s survey respondents said their main consideration while booking flights was cost. While 79% have taken steps to avoid baggage charges, 11% go to the extent to chuck out items to keep to the weight limit. 65% of respondents that did not use domestic airport cafes made this decision because they thought they were too expensive. And of those that did use the cafes, only 64% then thought it was fairly priced. Price is a common theme, don’t ya think?! Well, here are some tips to save money while travelling within New Zealand! Flights within New Zealand can vary based on the time of year, how far in advance you book and current price of fuel. However, flights are expensive and this can be put down to the small planes and therefore smaller number of people paying towards all the costs involved. But there are certain things you can do to help minimise the cost on your part. The rule of thumb is the more in advance you book New Zealand domestic flight tickets the cheaper it is, so the best tip is to book as early as you can. Research on incognito. Incognito is a private browsing mode that prevents companies or organisations from retrieving your browsing data and using it to their advantage. You ever googled something once and then you’re spammed with advertisements on the same product? Well, this is because you’re browsing is being tracked. Airlines usually tend to up the prices because they know you’re in the process of purchasing flight tickets. So, instead you can go incognito by right clicking on the Chrome or Safari logo and clicking “New incognito window”. Shop around. Research the different prices airlines offer as you’ll probably find cheaper if you look further. Checkout grabaseat, powered by Air New Zealand, where the airline sells empty seats that need to be filled ASAP. Due to this, prices are much cheaper on this webpage! Try to book in off-peak seasons when flight prices are lowered because airlines essentially want as many people as possible on the flight. The cheapest time to fly in New Zealand is usually the winter months, June, July and August, when there are fewer international tourists. Food in New Zealand airports is definitely not cheap, especially in comparison to supermarket food. Purchasing food from a supermarket before the flight is therefore recommended to save yourself money that could easily be allocated elsewhere. Similarly, when travelling New Zealand domestically don’t expect free airplane meals – you’re bound to be disappointed. A small snack is usually provided on flight but heavier snacks such as sandwiches will cost you and they won’t be cheap so again, this is where preparation is crucial to save money in New Zealand. To save yourself on Uber costs, which could set you back by more than $40 from Auckland CBD to Auckland Airport, opt for public transport or shared airport shuttle buses. At the time of writing this article, in the beginning of 2019, the SkyBus from Auckland CBD is only $19 one way or $36 for a return ticket. Similar services are run New Zealand-wide. For example, the current cost from Wellington CBD to Wellington Airport is only $12 on the “Airport Flyer”! Canstar Blue surveyed 2,500 New Zealand consumers across a range of categories to measure and track customer satisfaction, via ISO 26362 accredited research panels managed by Qualtrics. The outcomes reported are the results from customers who have visited a domestic airport in New Zealand within the last 12 months. In this case, 1,729 New Zealanders.